KIEV, Ukraine -- A Ukrainian military transport plane was shot down Monday along the country's eastern border with Russia, the defense minister said. Rebels in conflict-wracked eastern Ukraine immediately claimed responsibility for downing the Antonov AN-26 but Ukrainian Defense Minister Valeriy Heletey said the rocket may have been fired from Russia. Heletey said the plane was flying at an altitude of 21,300 feet, which he said was too high to be reached with the weapons used by the separatists fighting government troops. 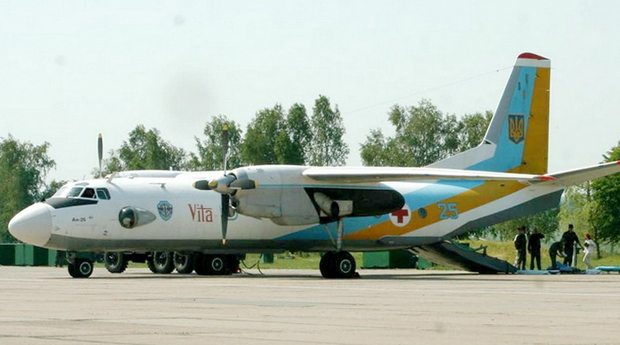 Ukrainian authorities say plane may have been carrying around 20 people but there was no immediate word on casualties. In the last two weeks, the government has halved the territory held by pro-Russia separatists, who have been forced back into strongholds around the eastern cities of Luhansk and Donetsk. Those two mostly Russian-speaking regions have declared independence from the government in Kiev. Fighting intensified Monday around Luhansk as government forces stepped up efforts to disrupt rebel lines and reclaim more territory from the faltering insurgency. One resident said panic was gripping the city. Despite reports of military successes, however, Ukraine's president announced he has more evidence that Russia has directly supported a separatist insurgency against his government that is dragging into its fourth month. The Defense Ministry said Monday that government troops had retaken several villages around the rebel-controlled city of Luhansk and had reopened a corridor to its civilian airport. "Due to successful offensives by forces in the Donetsk region, some militants are trying to leave the city," the Defense Ministry said in a statement. Rebels, however, insisted their fighting capabilities remain strong. A spokeswoman for the separatist Luhansk People's Republic told The Associated Press that they destroyed a Ukrainian armed convoy in the village of Heorhiivka, six miles west of the airport. She says at least three Ukrainian soldiers were killed in that clash. Government defense officials said their troops have taken control of several areas on the fringe of Luhansk -- including Metalist, Oleksandrivsk, Bile and Rozkishne. Those residential areas are north, west and south of the city, suggesting the government's plan to form a security cordon around Luhansk has yielded results. The leader of the military wing of the insurgency, Igor Girkin, also known by his nom de guerre Strelkov, had over the weekend predicted a bitter fight for Luhansk, a city of 400,000, and estimated that Ukrainian forces had deployed up to 70 tanks in the offensive. One Luhansk resident, Sergei, who declined to give his last name due to fears of reprisal, told The Associated Press that panic had gripped the city Monday due to reports that Ukrainian paratroopers were intermittently entering the city center and detaining rebel fighters. Exit points from the city have been blocked and militiamen are confiscating cars and belongings from residents attempting to flee, he said. The Defense Ministry also said rebels were routinely commandeering cars from civilians in the separatist areas, but it was not immediately possible to confirm those claims. The government in Kiev has insisted that that the separatists are receiving substantial manpower and military equipment from Russia, a charge Russia has always denied. "In the last three days, Ukraine's armed forces have been attacked with Russian multiple-rocket launchers," President Petro Poroshenko said Monday at a meeting of his security officials. Poroshenko also said there's evidence that officers with Russian army have been involved in the hostilities but he did not elaborate.